Choose the times table to practice from your 2x up to 12x. You are given a list of the times tables table and answer and the ones to swat – great for revision and then off you go. You can only swat the mossie when it lands and if you miss any you will hear them – and they change colour. If you swat the wrong one, it is so cute saying ‘not me’ or ‘aha’ which will bring a smile to your child’s face. A unique way to help your child learn their time tables which is such an important part of math. The app is quite fast paced, so it keeps it fun and interesting and the added challenge of beating your high score. Are you ready for one of the fastest and most fun ways to practise your times tables? We’ve turned learning the times tables into a fun, fast-paced, mosquito swatting game. Swat as many of your correct times table mosquitoes as you can before they fly away. If you miss the right ones, they’ll take a greedy gulp of blood and buzz off. 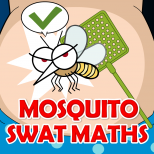 Let our Mosquito Swat Maths app give your child a head-start on their road to Maths success. Play along with your child or play against them, however you play you’ll combine learning with fast-tapping fun. When it comes to taking the first fun steps towards successful numeracy/multiplication, we think it’s a hard app to beat (or swat). We know there are many different strategies to learning and teaching Maths, and this fun app can form one part of your approach. It is designed to be used over time; as your child’s Maths skills/knowledge improves, let them try new times tables levels. It’s not just for kids! Test your children, learn with them or play against them, but most of all have fun, as you see how many mosquitoes you can swat before they drink your blood. You’ll need to think quickly and swat even quicker. Beat your own score, beat your friends’ or classmates’, and your family’s. Once you play, you’ll find it hard to stop swatting. Developed by online & mobile education specialists, Cambridge English Online Ltd, with 10 years’ experience creating fun, online and mobile resources, Mosquito Swat Maths:Times Tables has been tested and reviewed by teaching professionals and parents and aims to support National Curriculum guidelines on teaching and learning numeracy/ time tables/multiplication. – The longer you play-the more mosquitoes you have to swat! – Each times tables level teaches 26 multiples to look out for, plus lots of distractors! – Each level has its own support page to practise the times table and multiples you are being tested on. Help is only a click away! Check out our range of other popular Maths learning apps on our developer page. Don’t miss our Maths Martians and Maths Songs series!